Don't know if it's been mentioned, but about 11 years ago in Zimbabwe we found lamb and mint jelly-flavored chips. They were actually rather addicting. Gods, I LOVE the British! Hedgehog is a large meatloaf sort of thingie with rice or other bits sticking out of it, no? Or am I channeling something odd from an old episode of Two Fat Ladies? Getting the info on this may help me understand why hedgehog crisps would be disgusting, provided we are not discussing actual hedgehogs. That I would understand. Now these are Chips, freshly made every hour! Only in Canada you sya? Pity! Until I read this thread I hadn't realized that we live in the nexus of quality chip making. Although truth be told, Japan and India sound terrific too. I was a little surprised not to hear our Hawaiian neighbours chime in though--or maybe they just want to save all the Maui Chips for themselves. They've been a treat since we started going there as kids and we indulge ourselves still.Thick cut, thunderingly snappy, a little salty and great potato flavour. The only known antidote to full-on addiction is beer served precisely at 33 degrees. Feel the burn. Back here, and although not strictly speaking chips, Rain Coast Crisps (available through Lesley Stowe Fine Foods) are delicious, but, let it be known, actually good for you. It's a fibre thing. Maybe that disqualifies them out of hand. What with the tightly held opinions/favourites on this thread, good thing we didn't get into dips. Here's something interesting I found on taquitos.net... Lasagna Chips! Also, some variants: Lasagna Tomato Basil and... Lasagna BBQ? Taquitos gives the "original" a bad rating, but the two variants good ones. Miss Vickies Lime & Black Pepper (on the market for about a year now) is the most addictive chip flavour ever. Can't get enough. Don't let's start dissing each other's vices -- that sort of thing gets ugly real fast. Good christ man...a life without the odd potato chip is not worth living. Wait, lemme guess...we should only be eating Foie Gras, truffles and frickin' calve-ee-yar? Ahem. Miss Vickies' Lime and Black Pepper is quite a nice little bite, and their slat and vinegar is a cut above the norm. I only wish this were an American disease. Why do we have so few (and such lame) potato chip flavors in the US? Is there any place in this country where you can buy a decent variety? Even Mitsuwa (the Japanese market) is a very good store, but no use in that regard. 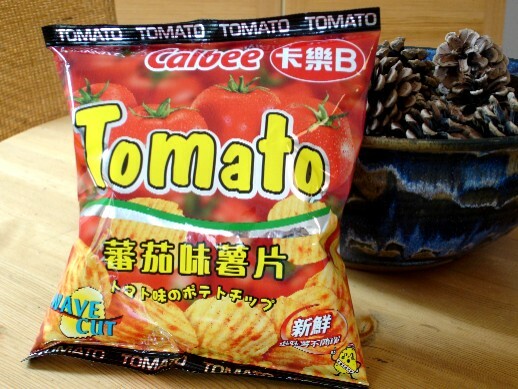 In the interests of eGullet potato chip research, I picked up a bag of these at a local Asian supermarket the other day. Specifically, I wanted to see how these would stack up against ketchup-flavoured chips available here in Canada. They were light, crunchy, not too greasy and sweeter than ketchup-flavoured chips. Less red residue left on my hands too, which is a plus. The bag lasted all of about 2.2 seconds. And no, I didn't share with anyone else. Kettle Chips just came out with 2 new flavours: Cheddar & Beer, and Spicy Thai, which were the "People's Choice" flavours of 2005. The cheddar & beer really does taste like aged cheddar & beer. The ingredients included hops & yeast. My sister hated it though, as she can't stand beer & stinky cheese. My dad loved it! Guess what he likes to drink? The spicy Thai isn't too spicy, which is always a plus in my books. I don't know whether the flavour's authentic or not, but I like it better than the cheddar & beer. The honey flavour hits you first, then the ginger, cilantro, and hot pepper flavours (jalapeno & cayenne) join in. Actually, the chips with Old Bay are made by Herr's. They struck the deal with Baltimore Spice Co. (now McCormick & Co.), the maker of Old Bay. Utz's are called "The Crab Chip--Potato Chips with Chesapeake Bay Seasoning." I did try Herr's "Steak & Worcestershire" chips once, and was mildly impressed. They tasted of instant beef broth and Worcestershire. --I note that someone brought up "salt and pepper" potato chips in this thread. Both Herr's and Utz (the two leading chip brands in this region; Utz outsells Herr's overall--it's the #4 brand of chips nationally--but Herr's is more popular within Metro Philly) offer their own versions. The thing I find amusing about these chips is that the promo text on the back of the bags are similar ("Salt and pepper...so simple, so good! "), but if you read the ingredients list, you will find they aren't that simple. In addition to the salt and pepper, you will find onion powder, garlic powder, a few other spices, and I think even MSG (I'll have to check the label again next time I see a bag). I like Herr's ketchup-flavored chips (Heinz, of course). But what I'd love to see is a ketchup-and-mustard-flavored chip. I'm rather fond of mixing the two condiments together and dipping fries in the blend, so I don't see why the combo wouldn't work with chips. I was somewhere recently--one of those Asian convenience grocery/buffets, I think--where I saw bags of Lay's cucumber chips. Those, I think, might work well. And speaking of Lay's: Anyone remember their "Flavors of America" series of limited-edition chips based on regional flavors? ISTR that there were some interesting combinations in that series, including lime, Monterrey Jack cheese, and cilantro among the various flavor blends. If we want to get doubly artificial, though: anyone out there tried Pringles Pizzalicious crisps? Lay's has cucumber-lemon chips in China (and perhaps elsewhere, not sure) that are great. Also around are Peking duck, stir-fried crab and the like. This year's edition of "Where In the World is Matt Lauer" on NBC's Today Show included a segment from Shanghai where he explained why Chinese snack foods had these unusual (in the West) flavor combinations like lemon and potatoes. As he explained it, certain types of foods are considered "hot" by the Chinese--this concept has nothing to do with the temperature of the food or its spiciness in Scoville units--and these foods are balanced by contrasting "cool" foods. Potato chips, it seems, fall into the "hot" category, and citrus fruits and many vegetables are "cool." So a cucumber-lemon potato chip strikes the right balance. The new flavors, thai ,and beer/cheddar, from Kettle Cooked at Whole Foods, are the bomb, fo shizzle, fo' sho, so desu ne. Doritos has come out with some nice things for the Turkish market. There is a white(feta) cheese with nigella flavored one, as well as a tomato and poppyseed one that is very good. During a trip to Puerto Vallarta last November, I got absolutely hooked on Sabritos (the Mexican equivalent of Lays) Chile y Limón flavour and am considering buying a hard-sided suitcase to bring home a gross of them next winter. 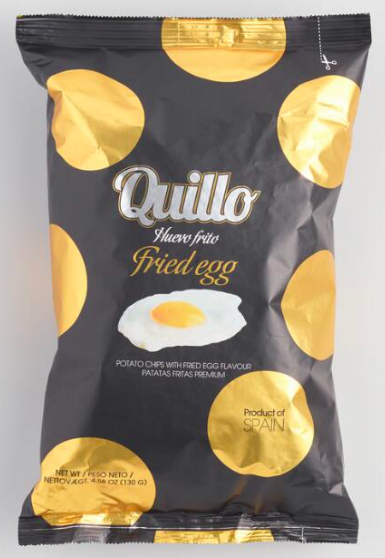 I hope dredging up an old thread topic is not frowned upon, but I just tried some Quillo Fried Egg flavored Potato Chips, from Spain, so qualifies as international flavor. Picked them up on whim at World Market. They taste Just Like fried eggs to my palate. I like them. $3.99 a bag, smallish bag. The other flavors stocked were White Truffle and Spanish Ham. I'm planning my return trip to grab those for a try. I still have a coupon. I'm about a month and a half late, but I just saw this post. I actually tried the Quillo White Truffle flavor about six months ago, also bought at World Market. I bought them for some pre-dinner nibbles at a small dinner party I hosted. They were quite good and everyone enjoyed them, but they were too rich to eat a whole bag's worth. World Market had 30% off Irish-y things for SPD, of course. 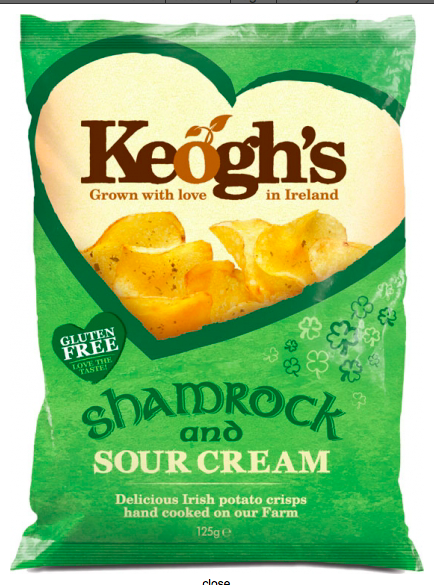 I succumbed to these Keogh's crisps, despite a kitschy name. The Household agreed these were the best ever sour cream/onion chips we have had. Chips were nicely potato flavored under the realistically tasting sour cream powder with the onion/garlic/cheddar flavor. I liked these better than the Quillo egg flavor, which I thought was my new all time favorite.